Owning one QSR is a big investment, owning several is even bigger. And it’s important to protect that investment. One way to do this is by mastering your cash handling procedures. When your employees handle cash correctly, it will ensure that none of it gets lost, miscounted, or stolen. But, with so many steps in the cash handling process, tracking it all can become overwhelming. Don’t worry, we can help make it easier. Let’s look at the top cash handling practices that all of your employees should follow. Make sure there’s only one manager in the safe during each shift. This will probably be the manager in charge or manager on duty. During every shift change, the safe funds should be verified by the oncoming and departing manager. The restaurant leader and Above Store Leader must be notified immediately for large variances. Cash amounts entered into the back office system or cash tracking form must be the actual cash counted, as opposed to the “should-be” amount. Keep your safe funds properly balanced at all times. This may mean shorting a deposit to make the safe balance or adding to a deposit to make the safe balance. The bottom line is that safe overages and shortages need to be reconciled by the end of the day. Cashiers should always count their cash drawer before accepting it. To keep drawers in check, schedule cashiers for shorter shifts or settle their drawer every five hours. Don’t allow multiple hands in cash drawers, only the assigned cashier should be working the register assigned to them. Cashiers should count (or witness the counting) of their cash drawer at the end of their shift and sign the corresponding paperwork. Scheduling is essential to getting this right since you need to allow managers and cashiers enough time to count their drawers at the beginning and end of their scheduled shifts. Put systems in place to verify $50 and $100 bills. The manager in charge should verify and handle the change for the guest. Counterfeit marking pens should be used for any large or questionable bills. Smart safe bill readers can also be used to detect counterfeit bills, especially for stores with smart safes. Limit the amount of money in the cash drawer. You can do this by using “cash drop boxes” underneath and near each cash register for storing all $20 bills, excess $10, $5, and $1 bills. But, the important thing is that the manager in charge must monitor the cash in the drawer. Register keys should always be on the manager’s person. Keys in the cash drawer is a huge red flag that there’s something wrong with your cash handling procedures. Count all cash on camera (if possible) and keep it secured, in a safe, locked cash drawer, or locked office. Reconcile reported daily deposits with validated deposit slips or Smart Safe Reports, and make sure they match. If they don’t, then contact a supervisor immediately. Getting the best return on your investment requires constant vigilance. 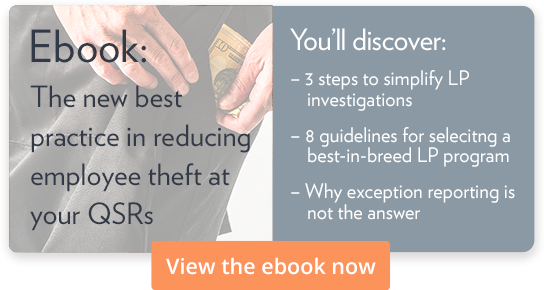 By following the right restaurant loss prevention and cash handling procedures, you can ensure that as little income is lost, miscounted, or stolen as possible. Check your cash handling procedures against our checklist, make any needed adjustments, and enjoy years of profitability.